Is your hair in need of repair? Wondering how to get rid of frizz? 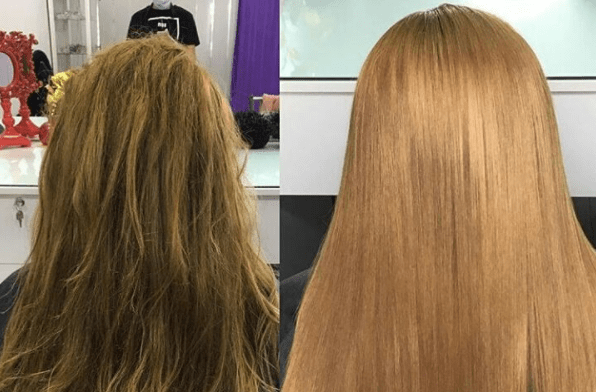 What about a keratin treatment at home? If you feel like you’ve exhausted your hair repair options, there’s still one miracle hair therapy that you might not have tried. After a few months of overstyling my hair, I noticed that it was brittle and damaged. I tried deep conditioning treatments, new products that promised to heal and I even stopped styling in an effort to heal my hair. When nothing worked, my stylist suggested using a keratin treatment. 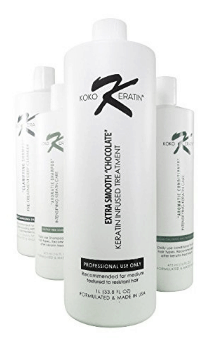 After looking up keratin treatment at home reviews, I ended up trying a few different versions. Read on to learn which is the best at home keratin treatment to finally restore your hair back to its natural shine. InstaNatural was one of the first treatments that I tried. 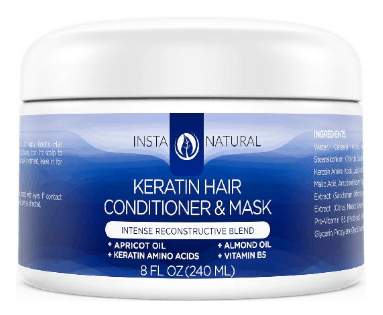 It’s a keratin hair mask that treats dry and frizzy hair. It features premium oils like almond oil and apricot oil. It’s nourishing for all hair types, making it a great keratin treatment at home for african american hair. My results with this mask were great. My hair felt stronger but also softer. It was incredibly smooth and my hair routine instantly became easier. I only needed a tiny bit of conditioner in the shower to eliminate tangles and my drying time was more than cut in half. My hair was full of life and everyone seemed to notice. I received nonstop compliments on the condition of my hair. One of the downsides of administering a keratin treatment at home is that it may contain formaldehyde, a less than ideal ingredient. 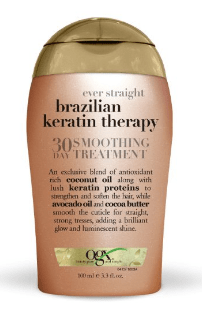 But OGX Brazilian Keratin Therapy is formaldehyde free and still provides you with smooth, straight, healthy hair. This product is unbelievably easy to use. I was a little concerned at first after the treatment because my hair felt a bit waxy. But this was only temporary and I was left with beautiful and straight hair that really seemed to glow. The price of this product is a little higher than most but you really get a professional outcome. It contains argan oil, coconut oil and plenty of amino acids. This keratin treatment also boasts of one awesome advantage. You don’t need to wait days before washing your hair like you do with most other treatments. This treatment did take a bit longer than other solutions available. All in all, it took me about four hours. But the results were well worth it. My hair was silky and shiny and I loved that I could wash it almost right away. Of course, if you have a schedule and hair type that allows you to wait a few days before washing, it will extend the life of your treatment. 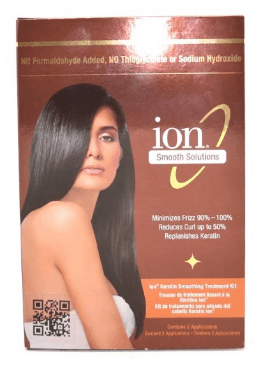 Here is another home keratin treatment that’s formaldehyde and aldehyde free. There’s no strange scent, which can be common with most keratin products, and the price fits into most budgets. I really felt that this brand penetrated my hair more than most. My hair felt much stronger and seemed to have more elasticity. It was completely revitalized and no longer looked dry or damaged. My typically frizzy style was gone and it was easy to style my hair exactly how I wanted. My results lasted for a solid three months as well. My hair is already fairly straight but a friend of mine with very curly hair tried this keratin treatment at home kit as well. She’s now a customer for life and says that with each treatment, her curls loosen a bit more. She’s hoping that in another couple of treatments, her hair will be mostly straight which is the look that she’s after. If you’re looking for a professional Keratin DIY kit that rivals what you would receive in a salon, this is it. KOKO Keratin infuses keratin deep into your hair with results that last up to six months. Another great positive of this hair remedy is its smell. Most keratin treatments have a unique odor but this one smells heavenly in comparison. It has a chocolate smell that really makes the process more enjoyable. If frizz is your enemy, this is the product that you need to try. It can be used on all hair types and contains wheat germ and argan oil. There’s no formaldehyde and can remove 90% of frizz. I waited about four days before washing my hair after this treatment. I don’t normally wait that long but I think that it really made a difference. My hair was definitely free of frizz and I couldn’t believe how much faster my hair dried, which saved me plenty of time each week. My hair was also incredibly smooth and silky. I couldn’t stop running my fingers through it! Keratin is one of the most important proteins found in our bodies. It’s present in our hair, skin, nails and teeth. Keratin is incredibly tough but it’s not immune to injury. If damage occurs to the external layer of keratin present in your hair, it can begin to look unhealthy, dry and brittle. Because the external layer of the hair is damaged, it can no longer lock out excess moisture. 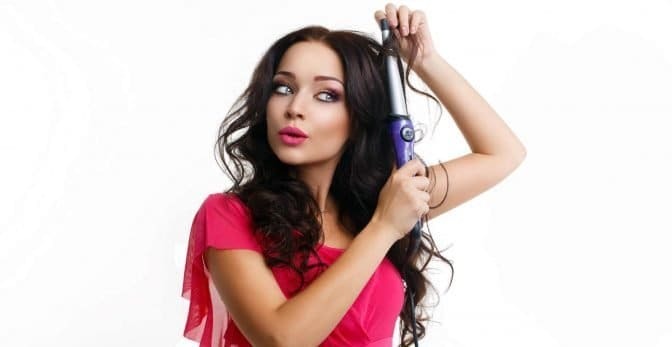 Hair can become frizzy and difficult to smooth and style. Luckily, you can infuse your hair with keratin and repair and restore your broken and damaged hair. What are the benefits for your hair? Keratin does plenty for your hair. Take a look at how beneficial a DIY hair cure can be. Think that you need to visit a salon for these benefits? While salons offer keratin treatments, it’s pretty simple to complete the at home all on your own. To complete a keratin treatment at home, you’ll need to grab a few things. Pick out your favorite keratin treatment at home kit (you’ll need anywhere from one to three ounces, depending on the length and thickness of your hair), shampoo, a towel, a comb, gloves, a hair dryer and a flat iron. Your hair needs to be as clean as possible before beginning the procedure. Most stylists recommend washing your hair at least twice if you have straight hair and three times or more if you have curly hair. Rinse your hair very well and do not use a conditioner. 2. Begin to apply the keratin supplement. First, dry your hair using the towel. Your hair should still be a little wet but not soaking. Shake the keratin supplement before applying. Begin at the tips and work towards your scalp. Rub keratin gently to work it into your hair. Do not let the keratin come into contact with your scalp. 3. Let the keratin work its magic. Gently brush your hair from top to bottom. Let the keratin sit in your hair for about 30 minutes. Then use a round brush and blow-dry your hair until completely dry. 4. Lock in the keratin. This is done when your flat iron. Turn on the heat and begin dividing hair into small sections. Run the flat iron over each section to seal the keratin. This is the most important and trickiest part. Make sure that each hair section is small enough that every strand is being evenly heated. It takes 48 hours for optimal results to be achieved. Don’t wash, condition or style your hair during this time. Keep your hair as straight as possible. Avoid tucking your hair behind your ears or putting it in a pony hail. After the 48 hour waiting period, you should use the best shampoo for keratin treated hair and condition as normal. Blow-dry it and take a look at your results. Your hair should be straight, incredibly shiny and unbelievably soft. Life after a keratin treatment will never be the same. If you’re like I was, your hair is unruly, gives you plenty of frizzy hair problems and, to put it simply, is a complete pain. You carefully plan out your shampoos each week to coincide with your styles. 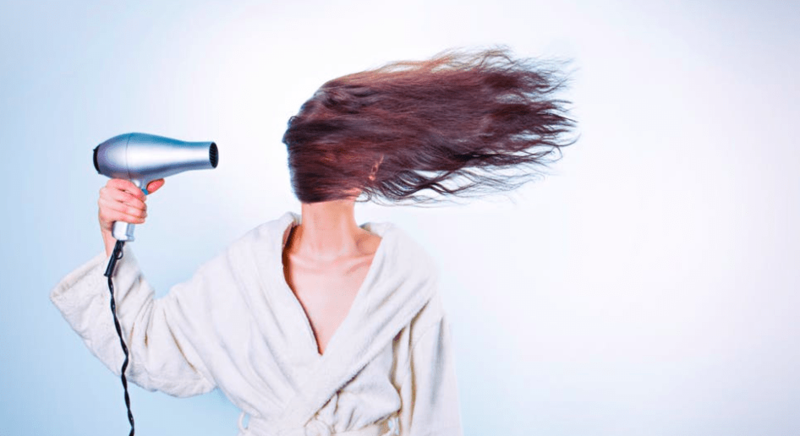 You spend at least an hour blow-drying and attempting to straighten and smooth your hair. On other days, you just throw your hair up in a messy bun because you just don’t have the energy to fight what Mother Nature gave you. But after a treatment, you’ll be able to wash your hair as needed without working it into your already hectic schedule. It will take less time to blow-dry and it will suddenly become easy to style. You’ll find yourself with more free time and less frustration, all because of an easy hair therapy. Once you’ve had a keratin treatment, you’ll do just about anything to make it last as long as possible. 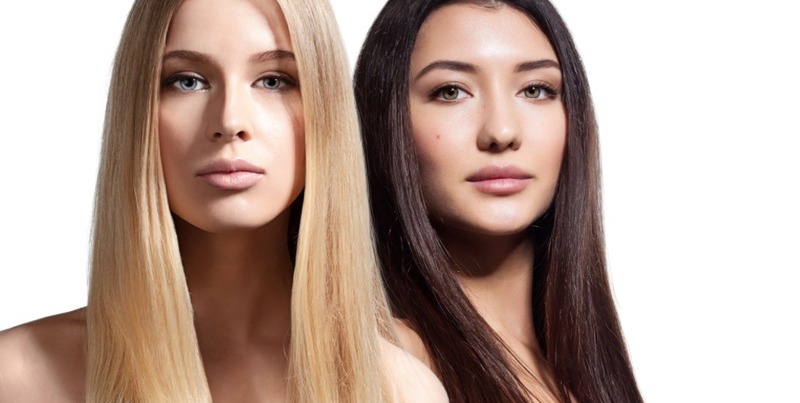 According to keratin treatment reviews, here are a few basic tips to help you get the most out of your product. Make sure that you keep your hair as straight as possible for at least two days after your treatment. Using a hair tie or a clip can leave dents in your hair. Make sure that the shampoo, as well as the conditioner you use, are sulfate-free. Know that sulfates take your hair’s natural oils and your newly added keratin. Sleep on a silk pillowcase. Cotton pillowcases can create friction and unwanted frizz. Silk lets your hair glide, preventing frizz and tangles. Keep up a keratin treatment schedule. 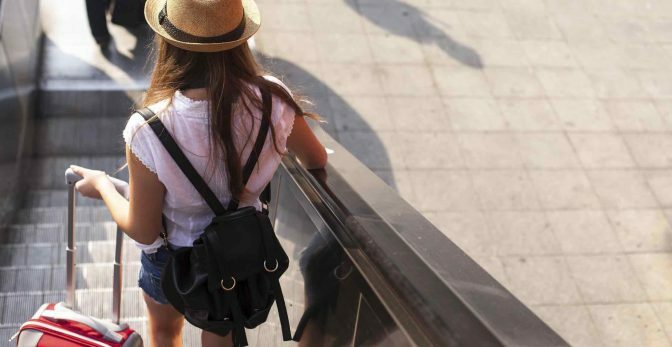 Going every three or four months will motivate you and keep your hair healthy and shiny. On average, you can expect a keratin treatment to last anywhere from two and a half to three months, sometimes longer with proper care. The best at home keratin treatment only needs to be administered two or three times per year to be effective and prevent negative side effects. Before administering a DIY keratin treatment, you should be aware of some safety precautions. Some treatments include formaldehyde, which can be a dangerous ingredient if you aren’t aware of its side effects. Under the high temperatures of a flat iron, formaldehyde can transform into a gas. This can be dangerous so always make sure that you are in a well-ventilated room when working with a keratin treatment with formaldehyde. If you work with a product that doesn’t contain formaldehyde, take a moment to look up the ingredients. Some companies use a substitute for the chemical that can be just as dangerous. You should also check the list of ingredients to make sure that you are not allergic to anything in the solution. You should also always use gloves when working with keratin. Make sure that the product never comes into contact with your skin or eyes and avoid inhaling it as well. If you suffer from psoriasis or seborrheic dermatitis, it is advised to speak with your dermatologist before administering this type of hair therapy. As long as administered safely, a keratin treatment is both safe and effective. If you’ve been looking for a semi-permanent treatment that leaves you with stunning hair, this is the miracle you’ve been waiting for. 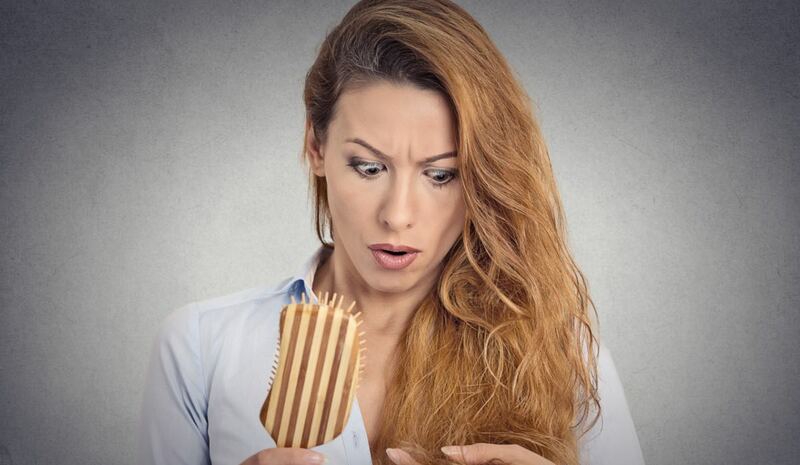 Don’t let salons overcharge you for your keratin treatment. Now that you know how to administer your hair cure at home, you’ll be enjoying your new style in no time with much more money left in your pocket.